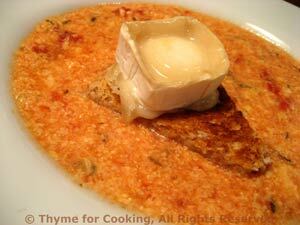 Savory Roman Egg Soup, Thyme for Cooking quick, easy starter. This is the second easiest soup I make - an Italian version of Egg Drop Soup (the easiest). I sometimes add chopped tomato to it, or not; sometimes croutons, or not. In small saucepan heat chicken stock, basil and tomato sauce. Add bread crumbs and cheese to eggs and whisk to combine. When soup is boiling pour in egg mixture. 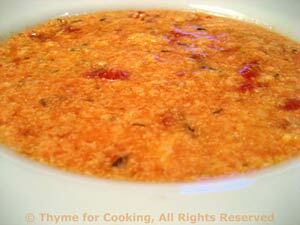 Immediately remove from heat, ladle into bowls and serve. Note: If I am making this in a dinner that uses whole tomatoes I add a few tbs of chopped tomatoes to the soup, as well... For interest. Optional croutons - if I have a bit of semi-soft cheese I make these for the soup. Toast bread, either in a toaster before cutting to size or under the broiler (grill). Cut toast into rounds or interesting shapes. Lay one slice of cheese on top of each toast. Broil (grill) for 2 - 3 minutes, until cheese is bubbly. Either serve floating in the soup or on the side.